Do you have a mobile marketing strategy prospects can use to shop when and where they want? If not, your marketing may be out-of-sight, out-of-mind because mobile’s the device people have within arm’s reach all the time. Mobile phones are an integral part of the purchase process – like it or not. They influence shoppers at every step of the way. Here are seven facts proving that as a marketer, you need to provide a mobile offering that supplies useful content and communications channels 24/7. Mobile shopping is about the numbers. Smartphones reached a tipping point in June 2011 when shipments exceeded those of feature phones. Currently, there are 90 million smartphone owners in the US according to comScore. More importantly, mobile shoppers represent a prime demographic; 64% are under 34 and 48% earn over $75,000 annually. Mobile purchasing is becoming more mainstream. 38% of smartphone owners or roughly 34 million people made a purchase via their phone at least once in the course of their device ownership. Mobile buyers need to see it to believe it. 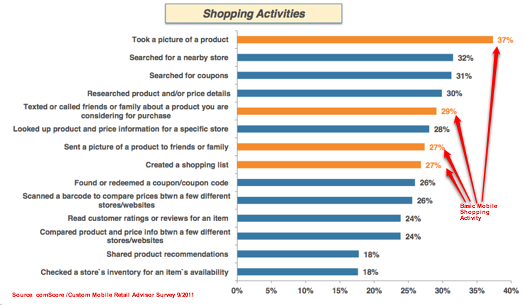 The top mobile purchasing activity is taking a photograph of the product. This makes sense since most shoppers need input on their purchases. Not sure whether to buy or not—show a family member or friend to get advice. 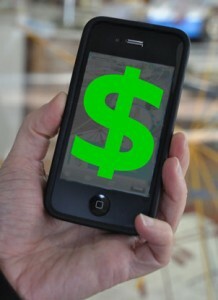 Mobile purchasers want you to show them the money. Despite your efforts not to compete on price, buyers look for coupons and discounts to ensure that they’ve got the best price. This is consistent with recent research regarding brands and pricing. For marketers, this translates to providing your best pricing via mobile channels since it can make or break the deal. Remember you may be competing against online only firms like Amazon and eBay. Mobile shopping is about location, location, location. 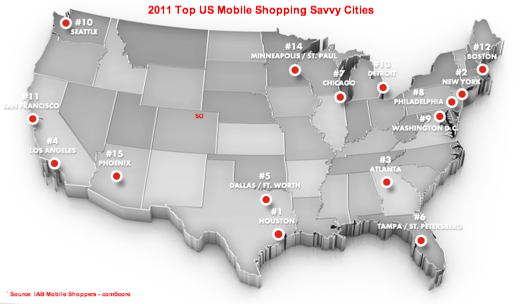 The top mobile shopping cities are Houston, New York and Atlanta. I’m not sure about you but they wouldn’t have been my answers. How does your target audience match up against these locations? If there’s a high overlap, you need a mobile strategy pronto! Mobile shopping doesn’t just happen on-the-go! Roughly one third of mobile purchases are made in-store. (Remember it may not be your store and it may not be a retail establishment!). More surprising is the fact that almost three out of five people are at home and two out of five are at work. 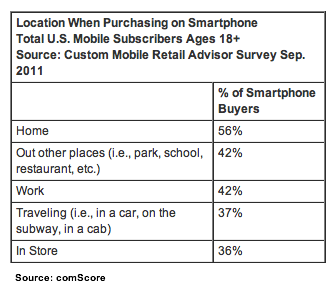 Mobile buyers make purchases in multiple locations depending on the situation. Mobile buyers don’t limit their mobile purchases by product type. With the growth of iTunes and e-books, it’s no surprise half of mobile shoppers have bought some type of digital product. I wonder why this amount isn’t closer to 100%. 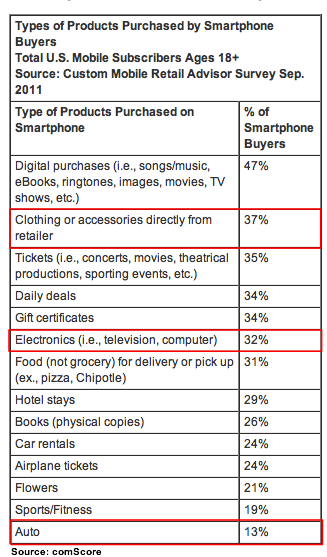 The second category of purchases: fast food, tickets and hotels make sense since smartphone owners are out and about. Similarly, last minute gifts in the form of gift certificates and flowers are easy, one-size-fits-all options that you send to avoid the “Oops! I forgot.” moment. What stands out in this list are the physical goods, namely clothes, electronics and cars. More than one out of ten mobile shoppers bought a car, a high research, high consideration purchase – via their phone! Smartphone owners use their devices to shop and buy products. With increasing smartphone penetration, this translates to the need for an integrated mobile strategy regardless of product type, physical location or distribution channel. What do you think about this research? What’s your experience been? Tags Charts, Mobile shopping, Research, smartphone. Bookmark the permalink. ← Do You Know What Gets Attention On Twitter? Thank you Heidi for this great information! Most companies are behind! At least here in Europe! Probably UK is better than most places but service and mobility is coming and it will be “with or without them”! We are far behind leaders such as Groupon, Zappos or Amazon “prepaying” shipment and “remembering” their online browsing customers’ interests! Lots to come and big potential for marketers to swiftly address this growing crowd of mobile shoppers!